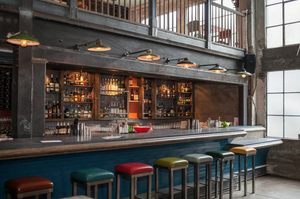 Bar Bites: Bubbles Tastings, a Benefit at Brass Tacks, Trick Dog's New Menu, Oasis Opens! The bar at Trick Dog. Photo from Facebook. Get primed for the new year with a Champagne tasting at ~BAY GRAPE~ wine shop in Oakland. The class takes place on Sunday December 28th and is called All About Champagne, Lovers! Sounds pretty perfect, right? The class takes place from 3pm-4pm and is $35 per person. There is space for 16 people, first come first served. Sign-ups begin that day at 1pm. 376 Grand Ave. at Perkins, 510-686-3615. Earlier this month, Geral Lowe, a doorman at ~BRASS TACKS~, lost his apartment and almost all his belongings when his building caught fire. He is fortunately safe, but he has tragically lost almost everything. To help raise some money to get him back on his feet, Brass Tacks is hosting a fundraiser on Monday December 29th at 7pm. There will be a silent auction and a raffle with lots of prizes, including gift certificates to bars and restaurants like Locanda, Biergarten, Piccino, Nopa, Boxing Room, and Mission Bowling Club. In addition, the bar will be offering drink specials (with all proceeds going to Lowe), and Deli Board will be serving food. So, basically, not only is this a great cause, but it’s going to be a pretty fun party too. Let’s all come together and help a fella out! 488A Hayes St. at Octavia. For those of you who follow the menus at ~TRICK DOG~, get ready for a new menu on Thursday January 8th. This means the San Francisco map menu is on its way out, so be sure to stop by for a Golden Fire Hydrant or Alcatraz before it’s too late (and note they’ll be closed January 1st-6th). 3010 20th St. at Florida, 415-471-2999. Heklina and D’Arcy Drollinger, the high-heeled hostesses behind the new ~OASIS~ in SoMa, said they were going to be opening their new 6,000-square-foot cabaret theater and nightclub on New Year’s Eve, and they are doing it! Tickets are selling fast for opening night. We wrote about the project a couple of months ago, and you can read some great details and backstory on the space here. The January calendar is already looking busy, including the launch of Heklina’s new party, Mother, formerly Trannyshack. Yay, a new playground! 298 11th St. at Folsom.